(CNN) — In his strongest words to date, Senate GOP leader Mitch McConnell, R-Kentucky, tried to quash talk that he would allow another government shutdown if he becomes Senate majority leader next year. Earlier this month, Politico reported that, if selected majority leader, McConnell plans to tell the president to accept bills reining in the administration’s policies or veto them and risk a government shutdown. Last year’s government shutdown was hardly a popular event, and McConnell’s Democratic opponent, Alison Lundergan Grimes, pounced on the story. “Senator Gridlock’s shutdown promise will hurt Kentucky small businesses,” screamed a Grimes campaign press release. McConnell opposed the last shutdown, fueled by a strategy from his fellow Republican Ted Cruz, R-Texas, to only fund the government by defunding Obamacare, which passed the GOP-led House but had no chance in the Senate. Still, McConnell is vowing to try to roll back Obama regulations that Republicans loathe, especially EPA rules on coal that Kentuckians see as harmful to their coal-rich economy. He says he plans to do that, if the GOP takes control of the Senate in the midterm elections, by attaching those changes to spending bills as they move through Congress. “One of the powers of Congress is to direct spending, and we’ve had an abuse of bureaucracy across the board. It’s been particularly bad here in Kentucky with EPA and the coal industry, that needs to have some directions from Congress,” McConnell told CNN. “The reason Harry Reid won’t allow votes on coal in the Senate is he is afraid it will pass, in other words it would actually pass with Democratic votes. 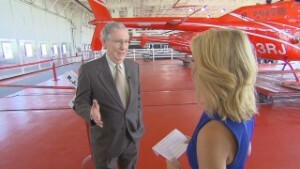 We’re going to have those kind of votes next year if I’m majority leader,” said McConnell. He again underscored he has no intention of taking that strategy all the way to a government shutdown — noting he is often the veteran legislator who comes in at the last minute negotiate a way out with Democrats.